Disponibili 3 colonne sonore di film con o prodotti da David Bailie. Un film di Gore Verbinski. Con Johnny Depp, Orlando Bloom, Keira Knightley, Geoffrey Rush, Jonathan Pryce. Titolo originale Pirates of the Caribbean: At World's End. Avventura, durata 168 min. - USA 2007. Un film di Gore Verbinski. Con Johnny Depp, Orlando Bloom, Keira Knightley, Bill Nighy, Stellan Skarsgård. Titolo originale Pirates of the Caribbean: Dead Man's Chest. Avventura, durata 150 min. - USA 2006. Un film di Gore Verbinski. Con Johnny Depp, Orlando Bloom, Geoffrey Rush, Keira Knightley, Jack Davenport. 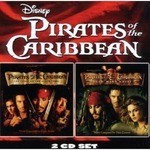 Titolo originale Pirates of the Caribbean: The Curse of the Black Pearl. Avventura, durata 143 min. - USA 2003.